While Lord Huron might be kicking off a head of steam across the pond, the reception on UK blogs has been pretty muted. Or rather, almost non-existent. A couple of blogs, such as Music Mule have managed to get on L.A based Benji Schneider early, following the recent release of his second EP under the Lord Huron name, 'Mighty'. The artwork of which is amazing, and reminds me of the times I wandered down to the River Ganges in Kolkata, on the occasional school summer holiday. The music is similarly beautiful and brilliant, capturing an essence of calypso pop which leaves Lord Huron somewhere in the middle of Animal Collective and El Guincho. But Benji throws in a folk element occasionally too, explaining the Fleet Foxes comparisons. Be sure to also pick up the Teen Daze remix of 'Into The Sun' too, which considering I rarely recommend remixes, is high praise without me actually saying anything about it. Of course, you'll probably hate it now. But with any luck, you'll fall in love with Lord Huron. 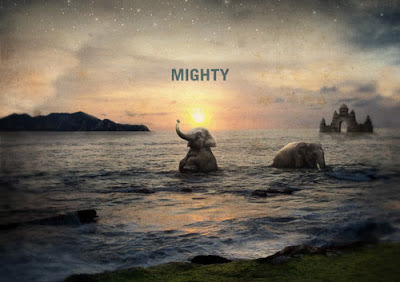 Purchase the 'Mighty' EP at Bandcamp, where you can also pick up the debut release 'Into The Sun' and a couple of free tracks, including the ones embedded in this post.